Even worse than 'Gnomeo & Juliet!' Made for people who think all original PBS Kids and Qubo programming is absolutely brilliant, anyone who has never seen a Pixar film, and cavemen. Rated PG for some mild rude humor, language and action. Yes, the “Too” on Hoodwinked‘s title implies that there was a first one. Didn’t know about it? Didn’t see it? Don’t feel bad, most of the world didn’t either. Thriving on the untouched scraps of fairytale material too dumb to be used in the Shrek movies, Hoodwinked! only made $51 million domestically at the box office. Why The Weinstein Company decided to make a sequel on a well-below-par flop is beyond me. Everything that Hoodwinked! got wrong in a kid’s flick stands uncorrected in the sequel. Instead of fixing their mistakes and making a quality kid’s movie, the simply made the same garbage in 3D presumably hoping that it might make decent money with the extra cost of 3D. The Hookwinked! 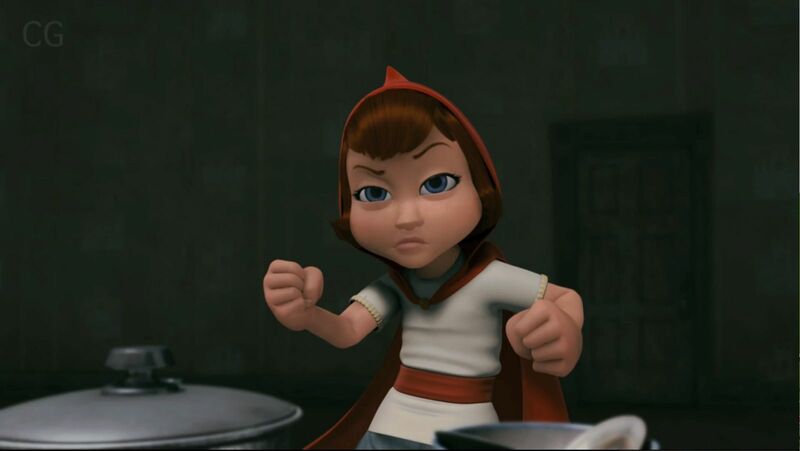 movies follow Red (Riding Hood), a tiny girl capable of giving any fairytale a happy ending. She and her fellow agents at the H.E.A., the Happily Ever After Agency, have been sent on a top secret mission to rescue Granny, Hansel and Gretel from a witch trying to steal the recipe of a truffle that gives infinite power to whomever eats it. Shrek the Third is the worst of the Shrek franchise. With that said, the most unfunny joke of Shrek the Third is hundreds of times funnier than any single joke in Hoodwinked Too. Any attempt at humor falls flat. Too much time is spent referencing REAL films like Kill Bill, the Die Hards, the Mission: Impossibles, the Back to the Futures, Kung Fu Panda, Pulp Fiction, Goodfellas, The Godfather, Silence of the Lambs, Star Trek, Deliverance, Star Wars and the Spider-mans. My daughter enjoys watching the simple educational non-profit computer animated kids programs on PBS Kids and the Qubo network. The cheap shows on those channels have better scripts and animation than that of Hoodwinked Too. Hell, the 16-year-old original Toy Story film has better animation than Hoodwinked! And what really makes the animation noticeably bad is seeing it in 3D. Usually a kids movie will at least get one star for effort, but whomever made Hoodwinked Too sure didn’t put in effort into it. Zero stars. As a not-yet-completely-proven star, Anne Hathaway voiced Red in the original Hoodwinked. The role of Red was recast for Hoodwinked Too. Hathaway wouldn’t touch it. We should all follow her lead and stay as far away from the sequel as possible.